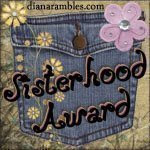 Passages to the Past: sisterhood award!! My dreary work day was just brightened up by two the lovely ladies who bestowed this wonderful award to me: Lilly from Reading Extravaganza and Smash from Great Books and Fresh Coffee. Thank you sooo much! Isn't the button so adorable - very hippie, I love hippie! Michele from A Reader's Respite ...she was my first follower and we've become really close since then. I am so blessed to have met her - she is a fantastic friend and a great support system and makes me laugh a lot! Ms. Lucy from Enchanted by Josephine ...super-fabulous blogger this one is, besides being sweet as honey, she is also a hockey fan and that scores some points with me =) Oh and Lucy, I promise I will get that song to you - I haven't forgotten! Marie from The Burton Review ...fairly new blogger to the scene, but you can already tell she's going to be around for a while! She writes great reviews for some great historical fiction novels! Amy, I'm glad you got this award. Your blog is always so cheerful and entertaining. Well done on your award. 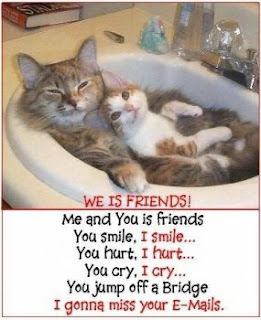 I love the kitties! Congrats to you all! Very well deserved.